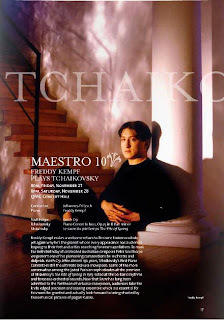 The Queensland Symphony Orchestra: Maestro Series presents Freddy Kempf Plays Tchaikovsky at the QPAC Concert Hall, Brisbane. This was my first hearing of the Queensland Symphony Orchestra. It was also my first visit to the QPAC Concert Hall. The program began with Peter Sculthorpe’s EARTH CRY, in celebration of his 80th birthday. Originally written in 1988, the version played for this concert was a revised score, prepared in 1999. In the original Sculthorpe wrote "perhaps we now need to attune ourselves to this continent, to listen to the cry of the earth, as the aborigines have done for many thousand of years."…. "The new version is in two linked sections" the first is ritualistic, its melody and accompaniment suggesting Aboriginal chant and the landscape itself. The second, in its broad melodiousness, brings the material of the first section to its consummation…." A soloist, didjeridu player, Harold Wilson, played with the orchestra, conducted by Johannes Fritzsch, to weave the haunting indigenous impulses of the work to great affect. The compositions that followed were composed by two Russians, Tchaikovsky and Stravinsky. It struck me while listening to this concert how marvellous the sound of the didjeridu and the Sculthorpe composition was, and listening to all three composers use the authentic musical expression of their indigenous people transposed and organised into the "high" culture of the symphony orchestra by these magicians, was inspiring. The haunting sound of the Aboriginal ‘folk’ instrument capturing a truth in the concert hall as moving as the usage that the two Russians employ in 'speaking' for their indigenous folk cultures, with their Western instruments, in two well known classic expressions of music. This may have been an even more moving experience of this work that was infected by my identification of the growing knowledge of the Aboriginal people and the cry of the Earth of Australia as the multi-national earth miners move into the banner of the age: Waste and Greed, in Western Australia. The sadness that this music registered with me was magnified with these reflections. How prescient our artists can be. Next, the guest piano soloist, young British musician Freddy Kempf (born 1977), played Tchaikovsky’s First Piano Concerto, which despite its early rejection by the original dedicatee, Nikolai Rubinstein, has come to epitomise the romantic piano concerto. Certainly for me this score has a long history in my aural experiences. My first engagement with it, not in the concert hall, but as the featured sound track of some Hollywood film. (Probably, many!!! [?]) The restless, attacking piano music pitched against and with the orchestra has always held me in its thralls. Tonight this work was just as satisfying, although I felt both the orchestra and the playing by Mr Kempf were a little too conservative or safe in their expression. I was left in a nostalgic haze of faintly remembered, glimpsed, black and white movie images, rather than the electric present tense of arresting commitment in the hall, at the piano, beside the live orchestra. Still, it is still thrilling to hear the Concerto live. There is no substitute for the live experience. Freddy Kempf returned to the stage, after many calls by the audience, to play, blissfully, a piano piece by Liszt. It was very beautiful. Maestro Fritzsch, spoke to us of his special affection for the Stravinsky score: Le Sacre du printemps. THE RITE OF SPRING. Written in 1913, and first presented in Paris, as an accompaniment to a ballet for the Ballet Russes de Monte Carlo by Nijinsky, the work has always been a source of riot and controversy. The composer asserted "repeatedly (…) that he wrote THE RITE OF SPRING in order 'to send everyone' in his Russian past, Tsar, family, instructors, 'to hell'." This year I have heard the scores of PETRUSHKA and FIREBIRD, accompanying the work of the Australian Ballet. So, it was interesting to hear this longer work by Stravinsky, without the distraction of the dance. The sounds are just as mysterious as the other works, and I believe, of idiosyncratically authentic Russian indigenous origins. The colours of the Bakst theatre designs always swim into my head when I hear the score. Like the Sculthorpe at the beginning of the concert where the sound conjured the Australian ethos for me, there is something totally arresting in the sounds of THE RITE OF SPRING, that for me register a Russian temperament. Shimmering with the possibility of mood and violent contrapuntal juxtapositions. The orchestration in concert is not only thrilling to hear but fascinating to watch. The very large orchestra erupting in different spaces on the concert hall floor, at the behest of the conductor in respect of Stravinsky’s demand in his score. The past sonically connected to the present. Off the pages of yesteryear, into the present players hands to our vitally alive ears and hearts. Authentic truths never age, are always contemporary with emotion and meaning. The winding meanderings of the score contrasted with the pulsing rhythms, still, no matter how many times one has heard the music, still surprising and shocking. Mr Fritzsch told us of the riot that literally ensued the first hearing of this work. I wondered where that passion of expression by audiences had gone to. I hardly hear of such eruptions occurring any longer in any form of the Arts. Just what would cause such a response today? I wondered. To this concert, the Brisbane audience in a half filled hall, applauded and called generously. Stamping their feet enthusiastically. All three pieces.